You’re lounging in a plush sea side cabana after an afternoon snorkel in transparent ocean water. Your Significant Other has ordered some lunch while you were finishing your swim and a waiter has arrived with a plate of fish tacos. 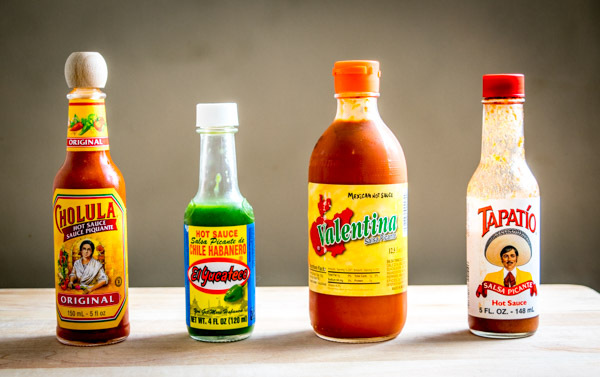 If you’re in Mexico most likely you’ll be choosing from one of these 4 hot sauces to liven up your lunch. And the good news is you can easily get them north of the border too. They can be livelier than some of the hot sauce standbys in the States so give ’em a chance and you might find a new keeper. 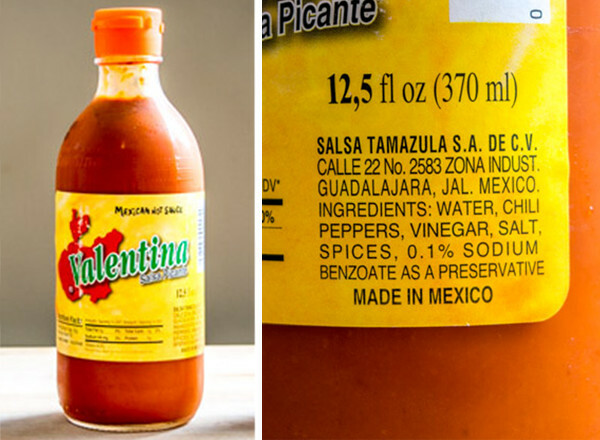 This is probably the most common Mexican hot sauce north of the border. Originating in Jalisco, Mexico, it has a sharp burst of heat from the Piquin peppers. 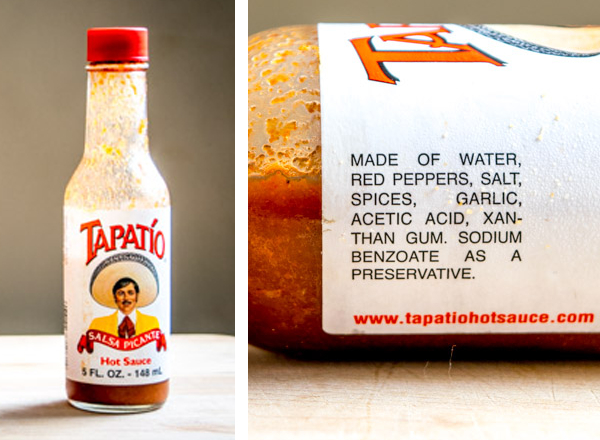 A reliable, general purpose hot sauce. OK, technically it’s from Southern California, but you’ll still find it frequently in northern Mexico. It’s the mildest of the batch we are looking at today. It’s a good gateway hot sauce and seems like a hybrid between traditional picante sauces and their milder American counterparts. Probably the most popular hot sauce in Mexican taquerias. Its reach is still expanding and now you can get it quite easily in the States. It’s easily my go-to hot sauce, with an initial heat burst followed up by a subtle, tangy citrus flavor. Not all picante sauces can claim to have both heat and flavor, but this one does. 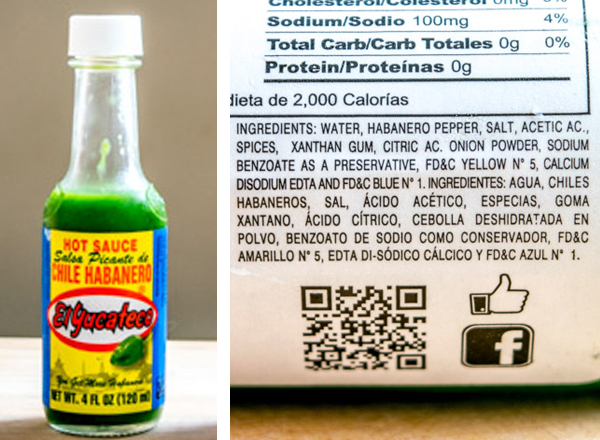 Every kitchen needs an equivalent of El Yucateco habanero sauce. Sometimes you just need some heat! Habaneros have 20-30 times the amount of capsaicin (heat) that jalapenos have, so as you would expect this sauce has real kick to go along with along with a sharp, tangy flavor. 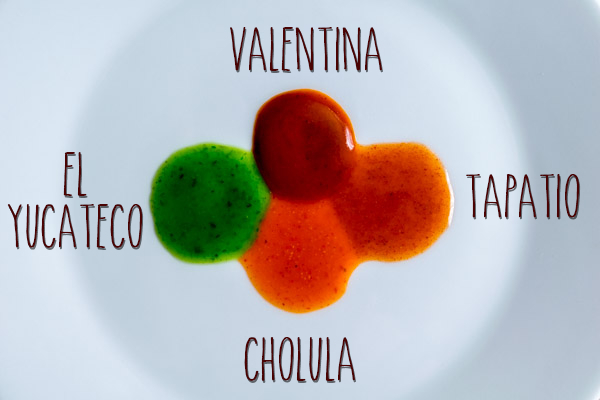 See how the Valentina has a higher viscosity than the other sauces? Why would this matter? A higher viscosity means it will hold its shape just a bit more than the other sauces. So instead of liquid pooling at the bottom of your plate, you’ll get clumps of high-potency flavor clinging to each bite. Que bueno. Keep an eye out for any of these hot sauces and consider adding them to your repertoire. Most can be found in gourmet stores or Latin markets, and sometimes in the ethnic food aisles of the bigger supermarkets. Update: don’t forget that you can always make your own hot sauce at home and it is super easy to do. 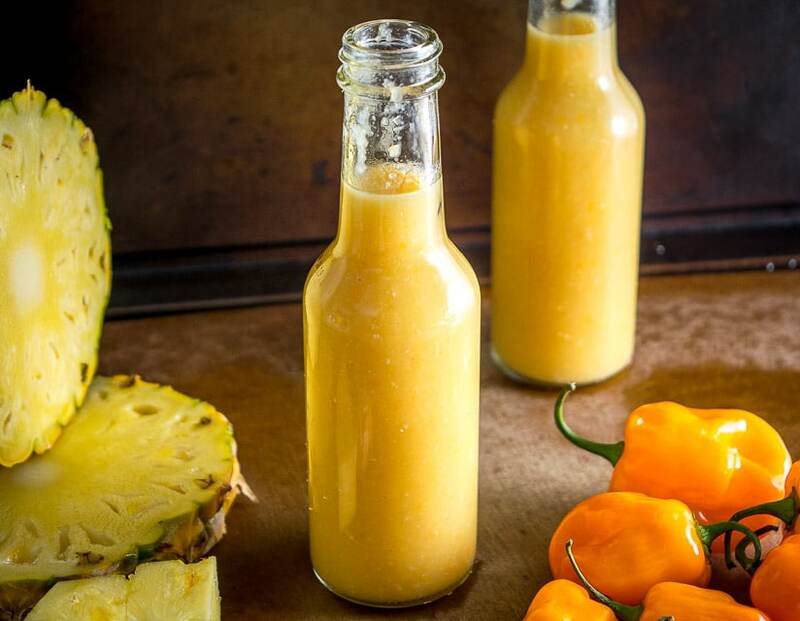 We just put up a recipe for a homemade Habanero Hot Sauce using habaneros, peach, and pineapple and it is delish! P.S. 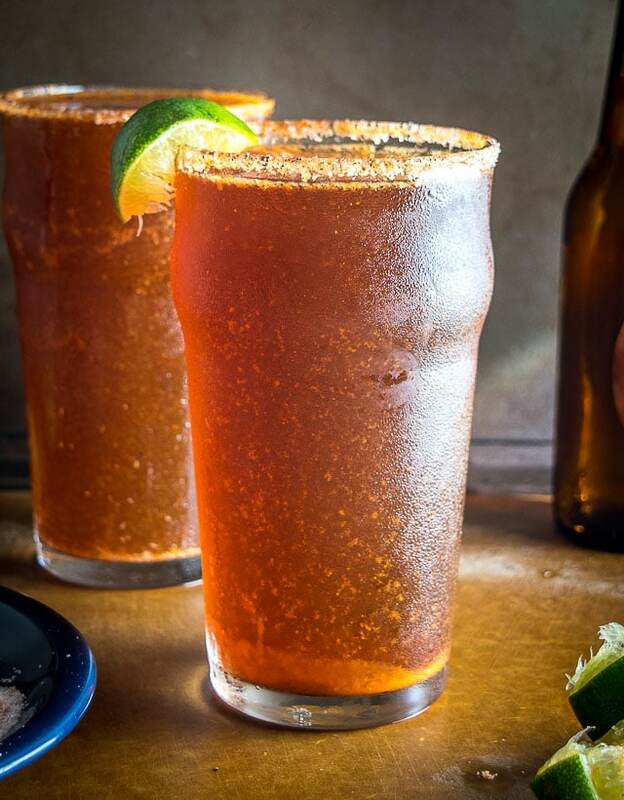 We use Valentina to make a wicked Michelada. Previous Post: « Did You Say Homemade Lard?! Hmmm never tried Salsa Huichol….better than Valentina??!! I looked for the Valentins when I was at the store this morning and they two types, one with the yellow label like you show here, but all also one with a black label. I could see no markings one either one as to why they were different and the ingredients seemed to be the same. Do you have any idea what the difference might be? Hey Steve! The black label Valentina is hotter than the yellow label one, but with a very similar flavor. I tried it years ago and didn’t like it as much as the traditional one (yellow label). Cheers. Hi Patrick, Thanks for the clarification. At another store I found the large bottles of both and the black was clearly labeled “Extra Hot”. Valentina is a great choice. Discovered it in the 80’s In Guadalajara. It is on every table there. Thank God we can get it here in n.Texas now. Yeah luckily I see it just about everywhere in the States these days, and super cheap too — even better! 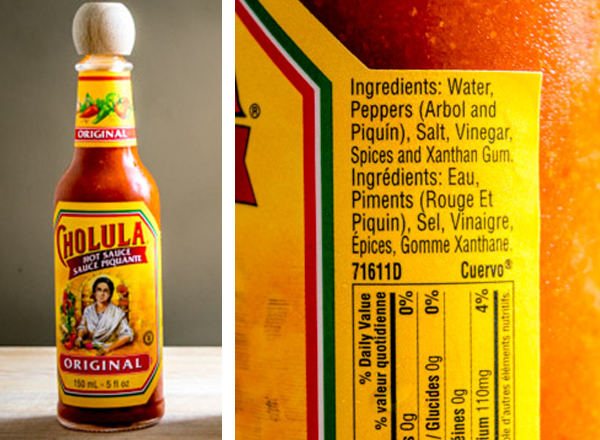 Please make a chipotle Cholula copycat recipe! I’d love a food additive free version! Hah okay, I’ve had a chipotle hot sauce on my recipe to-do list for awhile now so maybe your note will be the final nudge to push it to the forefront. Hope you’re finding some keeper recipes! What would you rate the heat factor of the Extra Hot Valemtina? Hey Al! I think that black label Valentina is probably a 7 or 8 out of 10. Cheers.